If you stuff an untrained person into a hot mascot costume, that’s precisely what your audience is going to get. Although terribly amusing to people that are not you and likely to get your mascot circulated all over social media, a mascot fails at an event is not a desirable representation and can be damaging to your brand. Professional Mascot performers know how to make a mascot not only stand out; but command the right kind of attention in a crowd. They will meet, greet and mill around with the guests creating a buzz, energy, and atmosphere that puts your audience in the mood. The pros know how to entertain and attract both customer and media attention. Once they have that attention, they know how to make the most of it! Unless you are famous yourself or are willing to go bankrupt paying for a star to attend your event, people are not likely to circulate photos with an unknown person on their social media. Bring in the giant stuffed performer and its selfie city! Mascot performers should have boundless energy and exude confidence, the last thing you need is a giant panda meekly asking guests if they would ‘like a flyer.’ Professional performers have a knack of not only distributing promotional material; but encouraging guests to enter draws and competitions. They’re masters at collecting that sometimes elusive and ever-valuable contact information so you can follow up with your potential clients post-event. 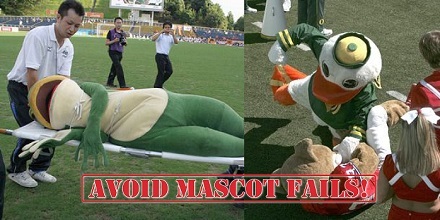 Mascot performers can carry out product demonstrations (within reason, the costume will need arms at the very least.) Mascots have a better impact if they don’t speak as the muffled words can be inaudible or in a voice not suited to the character. Performers know how to communicate their Mascots’ personality and your brand to the crowd through masterfully perfected gestures. Think about it, how would you successfully portray shaking hands, laughing, blowing kisses or acting shy or boisterous when restricted by heavy armor? Would you get your message across or would you look like you’re being swarmed by bees? Event and promotion organization can be stressful even for the seasoned Event Manager. AMS Promotions can supply trained mascot performers nationally. All you need to do is supply the marketing materials and a brief. If you’re new to the idea of a mascot for your brand, you can always hire a costume to trial at your next promotion. Give yourself every chance of success by investing in the professional assistance you need to rest assured your brand and costume are in capable hands.